Venus Swirl Blades are Gillette's best razor blade refills. They are 6x more flexible than Venus Classic razor blades. They work best with Venus Swirl Women's Razor with FlexiBall technology. Razor with Venus Flexiball pivots to contour to your body for a flawless shave. 5 diamond?like coated razor blades, perfectly balanced, glide over your skin. The water-activated ribbon of moisture around the blade helps protect from nicks & cuts. MicroFine comb guides hair to the blades that capture virtually every hair. Any Venus blade fits any Venus razor handle, except Simply Venus. Choose smooth countoured moves! 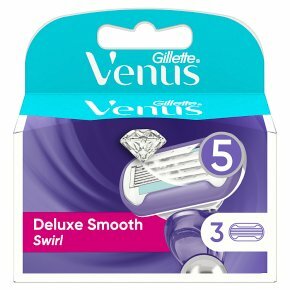 Gillette Venus Extra Smooth Swirl women's razor blades are designed with Gillette's revolutionary Flexiball and 5 individually adjusting Contour blades, the Venus Swirl helps capture what other razors may miss. It contours over curves for flawless beauty, long-lasting smoothness and virtually no missed hairs.